Announced in the past few days from the developers of Niantic Labs, the event Pokémon GO dedicated to the Equinox of 2019 is finally available for free on android and iOS devices. This is the umpteenth initiative, a weekly that focuses on the presence of certain types of Pokémon, and offers a bonus very interesting for all Coaches: here is an overview of the main information. The Event of the Equinox 2019 Pokémon GO, available now, will continue until next Tuesday 26 march 2019 22:00 (Italian time). Between the content, the main event should be reported to spawn increased grass-type Pokémon, and the introduction of two new moves that were previously not present within the Pokémon GO: this is Acidobomba and Vorticerba (but only certain species of Pokémon can learn them). 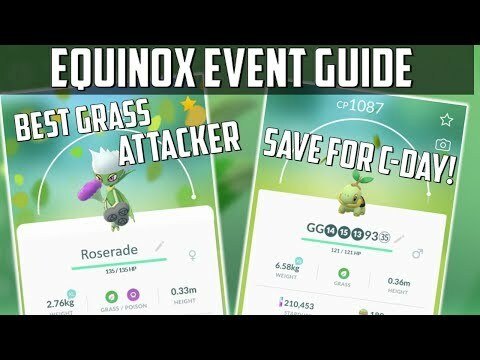 Also important is the change of the Pokémon Regional Lunatone and Solrock, which are now available, respectively, in two different areas of the world where, until yesterday, were absent; and finally, we recommend that you deal with as soon as the new Raid special of the Equinox, 2019 and go on field missions theme Pokémon Grass. Recall that recently the dataminer Pokémon GO have found information about the Friends feature Lucky within the code of the game: it will be probably added with the next updates.